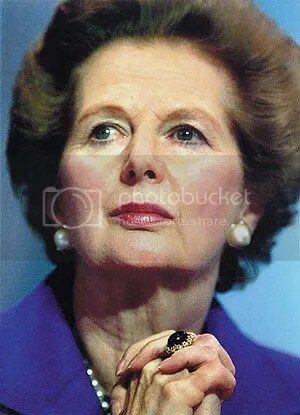 I’m not much of a television watcher but last night I was persuaded to watch “The Iron Lady” about Margaret Thatcher. “Dull viewing” many may think while others may feel the need to supress the shudder that rapidly works it’s way down their spine. Whatever you may have thought or think of her now though, it’s impossible to deny Thatcher had the CANDo Attitude to make tough but necessary decisions. Britain was in a mess and verrrry unpopular decisions were required to dig it as a whole out of the mire. Sure she made a few mistakes but on the whole, she got her head down and persevered against incredible odds in the true British “stiff upper lip” manner. Personally, she has my admiration. We are all individuals and quite rightly care deeply about our own well-being and personal comforts. We do this to the point that when a governmental decision affects us personally in a detrimental way, it’s almost impossible for us to see let alone appreciate how our sacrifice may benefit the many – not much of that famous vulcan “the needs of the many, outway the needs of the few” spirit around in Britain these days… particularly when all the governmental leaders we have to choose from are so obviously more worried about re-election and their own overweight pay cheques. With such egos running the government out to feather their own nests how can they expect those actually contributing to the economy to stop sulkily pouting out their bottom lip let alone stiffen up the upper ones. If Britain wants to pull itself out of the mire of quick sands it seems firmly lodged in, it needs to stop “feeling”. Stop feeling victimised, depressed, hard-done-by, jealous of others and that you deserve everything handed to you on a plate and start doing something. For all Britain whines about the EU and Angela Merkel in particular, at least they are doing something. Merkel is a lot like Thatcher in as much as she has the backbone to make tough, unpopular but necessary decisions. When I look at the likes of Cameron throwing tantrums, posturing politically and making weak decisions obviously designed to appease and secure re-election rather than the tough decisions that would put Britain back on course, I cringe. How can the political powers that be expect the overly large proportion of UK citizens that aren’t pulling their weight (and YOU know who you are) to stop feeling sorry for themselves, entitled and jealous of others and other tougher EU countries and start doing something positive if they, as supposed leaders, aren’t doing the same – and this isn’t aimed at The Conservatives, not one of the political parties has anyone meaningful with the country’s best interests at heart that is able to make themselves heard over the posturing of the current incumbents. Cameron and Co and anyone else with desires to get involved in government, please “Meet your Inner Imps”. Get in touch with Honesty, Courage and Self-Discipline, stop feeling and start doing by making the tough decisions… even if they make you unpopular (as they are doing with Merkel and did with Thatcher).